Couldn't edit my old thread. Some things I'm (still) looking for....(marked some of the more important things in bold but if you have any for sale/trade let me know). CD-ROM drive(s) - anything faster than 4x. Must be beige though. Amstrad PC1512 (1986?) - I doubt any gaming was actually done on this, I just know it was around. It's in a picture from when I was 1 or 2. 286 (1987? - 1991) - It had big round buttons and a really nice LED numeric display. The first game I played was most likely on this. What that was though, I have no idea. Could be Sopwith, Rogue, Alleycat, 3-Demon which I know well from those days. Or possibly one of the more obscure games that I have vague memories of like Beast or Pango. It could even be Boppie's Great Word Chase which apparently we got in Canada - which would make it July 1987. 386 (1991-99?, 2014-) - This was the main machine. The one from the 386 repair thread I made. Most of the old-school PC gaming that I can remember clearly was on this. Commander Keen, Crystal Caves, Jazz Jackrabbit, Galactix, Kilo Blaster, Lemmings, Major Stryker, Lotus, the Dizzy games etc. It was still in use after it was replaced by a newer computer until around 1999. Game Gear (1994-Present) - Despite all the computers we'd had my parents weren't fans of me or my sister spending lots of time playing video games and refused to buy a console that was specifically for gaming. For years I kept asking for a Master System or Mega Drive. I eventually had to settle for a Game Gear. It was cool at the time though but I only got a few games for it so it didn't have a massive impact on my gaming history. I still have it, caps replaced and in pretty nice condition with the original box. P166 (1996-2001) - This was a significant upgrade at the time, having completely skipped over the 486. It meant the internet and online gaming. I first tried this with Hellbender and Quake 2 around 1998 I guess. I ended up playing a lot of Quake 2 online, initially with a 28k modem. It also meant getting up at 5 in the morning before school to play Destruction Derby. Oh yeah and CARMAGEDDON - I spent so much time playing that game. N64 (1998-Present)Various PC's (2001-2010)Various Consoles/Computers (2010-Present) - This is when the whole "retro" thing started. I'd had enough of modern gaming so I bought a nice 21" Trinitron, got my N64 out and so it began. Almost all of the systems in this picture were purchased from October 2010 onwards. The modding started soon after. In 2010 I couldn't use a soldering iron. Acorn Electron (198?-199?) - Inter-weaved through my early gaming years was the Electron. My dad bought it before I was born. If the first gaming I did wasn't in fact on the 286 then it would have been on this. It was in use until some time in the early 90s when the PSU wire needed fixing. I recently fixed the wire so it is functional. However, like my original Game Gear & N64 it just sits in a box. Mega Drive/Saturn (2001) - I did actually buy both a Mega Drive and Saturn from Cash Converters in 2001 but didn't really use them at that time. Dreamcast (2005) - Same as above. Gamecube (mid-2000's) - My sister bought a Gamecube in 2003 which I played a few games on. I got one a couple of years later but again, didn't play much on it at the time. Like the screenshot challenge, but with random trivia (anything gaming related). Person who answers correctly asks the next question. In which game will you find Gordon Quick? Wasn't quite sure what thread to put this is, what section or what to call it. 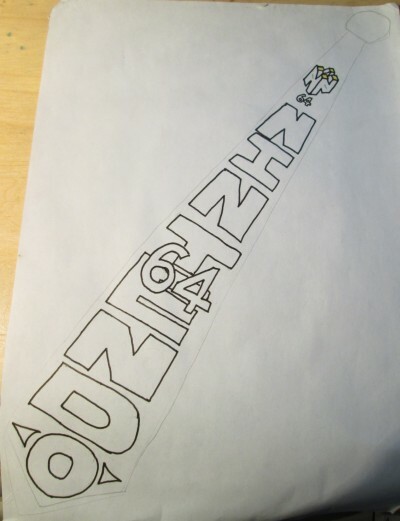 I recently found this tie design that was drawn by a friend of mine back in the day. Can't actually remember who or why (except for the fact that we all had N64's). 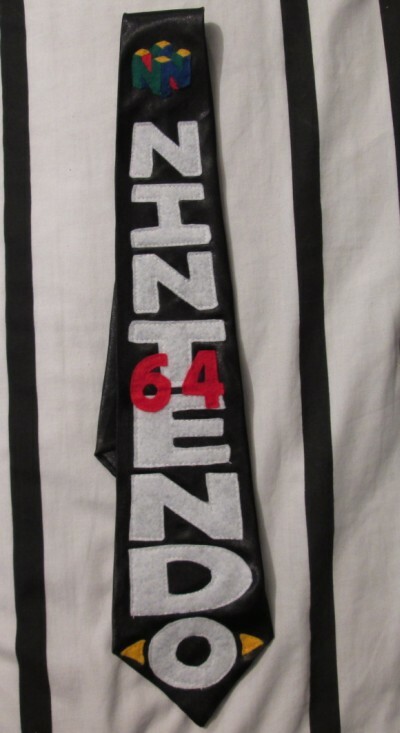 As a birthday present my sister actually MADE me a tie based on this design. Have you ever played a game that you didn't hate, maybe even liked the idea of but the gameplay just bored you to death? I was trying to play Syberia the other day. I quite like point & click games and this one has pretty good reviews but I just found it so boring that I gave up after about an hour. I actually tried to play it 3 years ago and only made it about 30 mins back then. 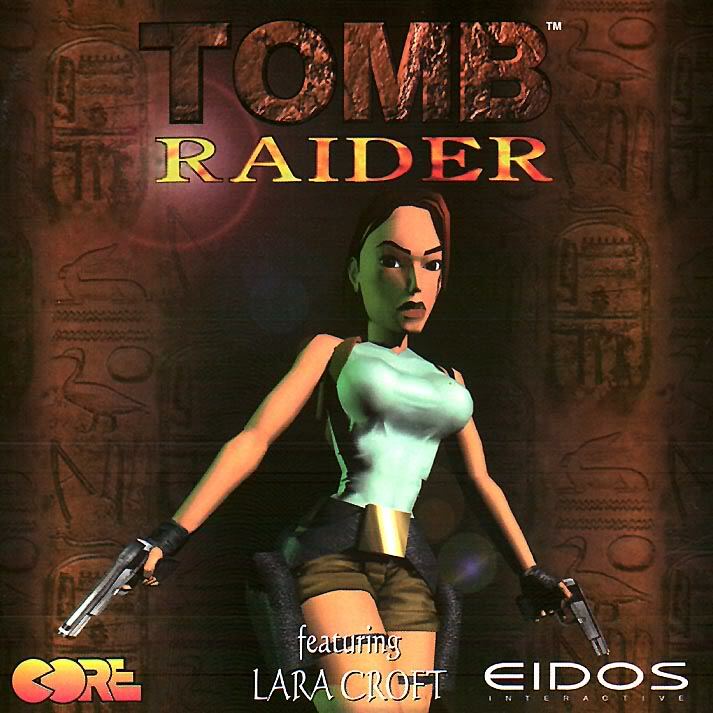 Tomb Raider I also just found boring. Again, I tried a couple of times to play this hoping that it would get more interesting but I just couldn't take it. Thought I'd try this as a forum thread for everyone else (did it in the chatbox earlier). Just name the game. Here are the first 5. So, I think I'm actually starting to prefer 8-bit games. Why? graphics. Obviously, from a technical standpoint 16-bit games have better graphics. But that's the problem I've been having. Also, sprite size. 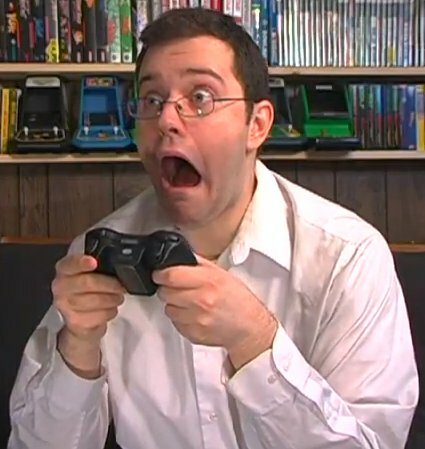 Everything seems way too big on 16-bit games not giving you enough time to react to what's happening. It's like playing zoomed in. I don't know, maybe it's just the games I've been picking but they've been giving me some real trouble lately. How a game sounds is important for me. A good soundtrack not only makes a game memorable, but can really help you get "in the zone" when playing. However, sometimes game music is just unbearable. This really started to happen in the 90's with CD-based systems introducing "real world" music into games. Which is a horrible idea as not everyone likes the same kind of music and eventually you end up playing something with music that you just can't stand. Here are some examples of things that I couldn't stand. As you know, I like to complete games. However, on some systems it's difficult to find games that I can finish and actually have an ending. I'm aiming to complete at least one game on every system I own this year. Also if you have any good recommendations for the CDi, 3DO and Saturn as well as I'm just not that familiar with the library of these systems. Hook (Master System/Mega Drive/SNES etc.) Skip to 5:10. Unlike a lot of old games I play, I could have played this one years ago. My best friend at the time had it so I could have borrowed it. However, it looked boring so I didn't. Many years passed and I would often hear about how great the series is. I finally decided to try it out...and guess what? I found it incredibly boring. If you've seen my completed games list for last year, you'll know I like to try and stick with a game to the end but I gave up. I had the same problem with Indiana Jones & The Infernal Machine - I don't know if I've ever tried so hard to make it to the end of a game and failed because of boredom. With old games it's usually the difficulty that stops me, but in this case....it was just boring. I rarely play games that just feel so cold and dead that there's no fun to it at all. All music recorded from real hardware. If you have any requests let me know. I started compiling this list a while ago. Pretty sure I won't be the only one here who likes to load a game just to listen to the music. Add any others you know. Alien Storm (Mega Drive) - I've got really close to finishing this, but I keep dying in almost the exact same spot right before the end boss every time. Just feel I've reached my limit with this one. Batman Returns (SNES) - With the exception of Streets of Rage I almost always find beat 'em ups annoying & awkward. Batman Returns (Mega Drive) - Different game, but stupidly hard. Die Hard Trilogy (PS1/Saturn) - I tried both versions but DH3 (the driving part) is impossible on both. Dr. Jekyll & Mr. Hyde (NES) - You might know this from the AVGN videos. I just don't see how it's do-able. Ecco: The Tides of Time (Mega Drive/Mega CD) - Maybe I was just bored/frustrated after the first one, but I didn't get very far on this. Final Fight CD (Mega CD) - It's just hard. Rick Dangerous 2 (Amiga) - I managed to get quite far in the game but you have to memorise everything perfectly. Super Mario Kart (SNES) - Cheating AI. The Adventures of Batman & Robin (Mega Drive) - Can't even get past the first stage. The Adventures of Batman & Robin (SNES) - Different game and yet also can't get past the first stage. X-Men 2: Clone Wars (Mega Drive - One of the best X-Men games I've played. Really difficult, but seems like it might be do-able (at least compared to some of the other games on this list). Alisia Dragoon (Mega Drive) - Gets very tricky near the end and I got stuck on it for a long time. It's a very cool game though. Captain Claw (PC) - One of the hardest platformers I've played. It's one of those games that just keeps getting harder and harder and harder. There's no break from it at all. Relentless. Castlevania: Bloodlines (Mega Drive) - At the end you have to go through 3 screens (one of which has flying Medusa heads) then beat 3 previous bosses, then beat Death, then beat another boss.....then you get to Dracula who has 3 different forms to beat. Castlevania: Dracula X (SNES) - Constantly getting knocked off platforms. Harder than SCIV. Descent 1 & 2 (PC) - Cheap bosses that spam you with instant-kill missiles. Ecco the Dolphin (Mega Drive/Mega CD) - The last 3 levels are ridiculous. "The Tube" is hard enough, but then you get to "The Machine". This is a level where the screen is constantly moving back, forth, up & down and you have to pick the right path every time or you're dead. There are enemies constantly coming at you too. This lasts for about 5 minutes, maybe more. You have to do this AND the last boss without dying. There's no password for the last boss so if you die you have to do the whole thing again. Ghouls 'n Ghosts (Mega Drive) - One of the easier games in the series, but still pretty challenging. Ghosts 'n Goblins (NES) - What makes this so much harder than Ghouls 'n Ghosts is that there is no boss checkpoint. If you die at a boss you have to start from the previous checkpoint. Also the controls are just so stiff and unresponsive you just can't make the character move the way you want it to. Hagane (SNES) - Pretty difficult over-all and you have to kill the end boss while climbing platforms at the same time. Journey to Silius (NES) - This one is a lot like Alisia Dragoon in a way. Difficult, but you actually want to keep playing it. One of my favourites from these lists. Kolibri (32x) - This game is just awkward. Really, really awkward. Mega Turrican (Mega Drive) - Not the hardest Turrican, but pretty close. Ninja Gaiden (NES) - Memorisation only gets you so far. The precision needed and constant re-spawning make this really difficult. Shadow Dancer (Mega Drive) - You just have to be so precise all the time. Revenge of Shinobi (Mega Drive) - That stupid dodgy double-jump gets me every time. Silver Surfer (NES) As hard as this is, I was a little surprised at how hard some people said it was (I found Ghosts 'n Goblins way harder). I'm not even very good at shoot 'em ups. Shinobi 3 (Mega Drive) - Much the same problem as Revenge of Shinobi. Super Castlevania IV (SNES) - Easier than Dracula X, which is easier than Bloodlines. But still pretty hard. The Adventures of Lomax (PS1) The start of this game is great. But after a while the difficulty is almost unbearable. Turrican 2 (Amiga) - Took me several tries just to get past the first level. Wing Commander (PC) - Mainly because I was trying not to get people killed near the end. But it's an annoying game anyway. So......what are the most difficult games you've played?